Christmas gifts at SMN Towers included a 1:36 scale diecast assembly kit made by Welly from China. 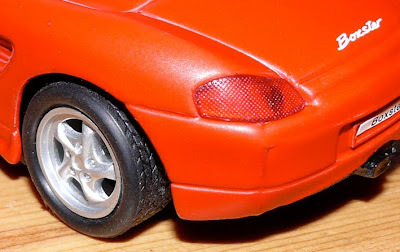 Welly aims its products mostly at the cheaper ‘toy’ markets, and is one of the lesser known names in the diecast business, but even so, the Boxster is a careful and impressive piece of model engineering. The Boxster’s ‘toyness’ is apparent in the fit-the-box scale and the inclusion of a (very powerful) pull-back motor, but the ‘modelness’ is shown by the attention taken over detail, in particular the instrument panel and the rear lights. With some care in the simple assembly - helped by the included mini-screwdriver - and some extra detailing on the mirrors, you can turn this Boxster into a decent shelf-top item. Note also in the pictures above, the fine ‘Boxster’ logo printing and rear-light texture, though the crooked numberplate will need replacing. The doors and their openings will also benefit from some retouching with matching paint - Volkswagen Mars Red looks like it will do the trick without too many misgivings. 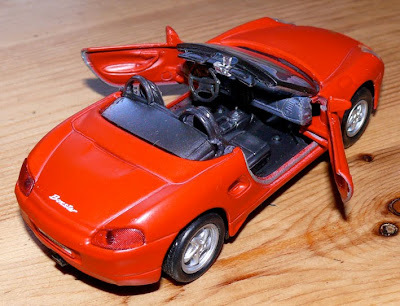 A problem that became apparent when this particular Boxster was unpacked was the windshield, which had a nasty scratch. So what to do? You’ve got two possible solutions, depending on the severity of the scratch. 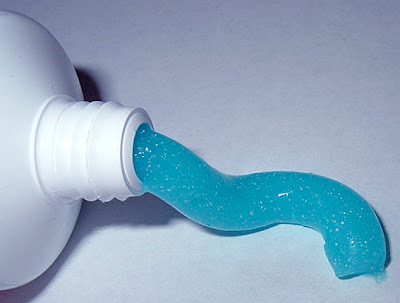 The simplest fix is to get the toothpaste out, as it contains a very mild abrasive. With shallow surface marking only, rubbing a small blob of toothpaste for a few minutes will usually produce good results. It’s also good for simply polishing up such areas, and certainly had this Boxster’s screen sparkling in no time at all. However, for more extensive damage you can try Xerapol, a special item designed for perspex, but which will also do nicely for most other plastics. The technique is the same - simply rub the offending marks with fingertips or clean cloth and all but deep scratches should polish out in a short time. Back to Welly - the company has been around since 1979, and like many Chinese businesses, is considerably bigger than you might think. Welly has more than 3000 personnel and turns out models and kits in all shapes and sizes. Welly is also into radio-control (RC) and produces a range of mostly European cars including Audi, Porsche and Mini, though there’s are lone entrants from the US (Ford Mustang) and Japan (Nissan 350Z) that sell complete with RC equipment, for instant plug-n-play action for buyers. Visit Welly here (warning - the site’s a slow loader). 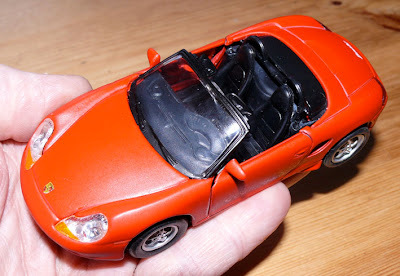 Welly also makes a Boxster S to 1:43 scale, with Porsche styling updates here. You can buy Xerapol here. 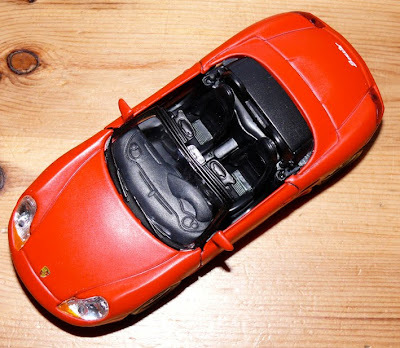 There are more Porsche Boxsters, both diecast and plastic kits, here.